James Boissett was born and raised in both suburban and harbour side Sydney, Australia. He enjoyed the rich tapestry of that busy hub of commerce with its commanding views of mountains and ocean. He has worked for many years in that central city environment, watching the ever-changing development, the crowding of buildings outwards and upwards, that have variously impeded and yet expanded views of the harbour and its natural surrounds. He lived around the Cremorne Point and Neutral Bay areas beside Sydney Harbour and then moved to Gosford in New South Wales. By contrast he also enjoyed many holidays in country New South Wales with his mother's relatives, exploring the rugged bush lands with their deeply contrasting colours and shapes. Having a passion for drawing and painting (mainly Watercolour) since a child, he entered his first Art Competition with a Watercolour of an Australian Landscape at the age of 14. James began his pursuit of serious artwork by completing a course in graphic design in 1980 when he developed his real passion for watercolour as a medium. His early works included character design and cartooning for children's books that emerged into a focused development of his skills as a representational watercolour painter of Australian city and landscapes, Nocturnes and Sydney Harbour Foreshores. His paintings abound with the clarity, the contrasts and strength of colour that is typical of his representation of the rich tapestry of the uniquely Australian visual experience, and his 40 years of painting, mostly in Watercolour. Emphasizing clarity, strength and subtlety, he uses light, tone and distance to achieve this. In particular, his Sydney scenes capture what he calls the "Sydney Light" - clear, warm and brilliant! Drawing on the variety of contemporary life, James likes the transparency and luminosity of Watercolour and the interplay of paint and paper. For this reason he very rarely uses opaque mediums such as gouache whilst never adding mediums such as acrylic, as these hinder the effectiveness of pure watercolour. Other water based mediums are less transparent than Watercolour for a number of technical reasons and do not display the same luminosity. His Watercolour Paintings are not mixed media interpretations and attempt to use the medium of Watercolour to its fullest potential. He has been Feature Artist in various prestigious Australian art shows as well as regularly exhibiting in major competitions and Gallery Exhibitions in Australia, France and the USA, winning numerous awards. The achievements may be seen not only in his outstanding results in prestigious Open and Watercolour competitions across Australia, but also in that his paintings being found in private and corporate collections across Australia, the UK, USA, France and Taiwan. In 2009 he painted for a month in France, on the South West coast off the Bay of Biscay, using the ancient port city of La Rochelle and island of ile de Re' as bases for daily painting adventures. On that visit he opened his second Exhibition in La Roche-Sur-Yon. Further exhibitions were held in France and the USA in 2010 / 2011 with another planned at the end of 2011 in France. In 2011 James painted in Italy. He produced paintings and, studies of areas such as Venice, Chioggia, Villages in the North West, and the Cinque Terra Coast and villages. Many of the Art Galleries that represented James for years had closed by 2014 which presented the opportunity of focusing more on Corporate and Private Commissions as well as Direct Sales. This included creating a dedicated in-house Corporate Gallery of his Artwork within an Australian International Company in Sydney’s CBD near Circular Quay and Sydney Harbour. A showcase of his Watercolour Painting and Sydney Harbour. He has been painting very large format Watercolour Paintings up to 2.5m long. Since the age of 20 James has been attending Life Drawing groups using Charcoal or Watercolour to render fast, loose studies of the Human Figure. This process assists the ongoing advancement of his Drawing and Watercolour skills whilst pushing the boundaries of the Watercolour painting "process". His Watercolour Figure studies abound with colour, vitality and expressions of form and gesture. Captured mainly under strong light, usually with timed poses of about 10 minutes each, the style is very different to the approach he normally takes in his artwork. Very free and expressive, they all display the main principles of Watercolour, the figure as a guide, and with no time for error. He has exhibited a number of these expressive Figurative paintings recently in a Sydney exhibition. They represent another view of the Watercolour process and the Artist’s broad capability whilst retaining the essence of the Medium of Watercolour. From 1979 to 1992 a Freelance Artist/illustrator for Art Studios, Magazine & Book publishers. 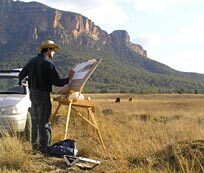 Full time Professional Painter and Studio/ Plein Air Artist, Commissions, Plein air painting expeditions in Australia, France and Italy. Some Private Tuition. Highly Commended at the 38th Drummoyne Municipal Art Society Annual Art Award for "Restoration The John Oxley" in the Watercolour section. Highly Commended (2nd prize) in the Wagga Wagga Quota Rotary Art Competition and Exhibition for "High and Dry" in the Open section. First Prize at the Australasian Turf Monthly Equine Art Award for "On The Mark" in the Watercolour section. Commended at the Camden Art Prize for "Bridge Street Shuffle" in the Traditional Section. Commended at the Camden Art Prize for "Maleney" in the Watercolour Section. Commended at the Camden Art Prize for "High and Dry" in the Open Section. First Prize at the 40TH Drummoyne Municipal Art Society Annual Art Award for "Landscape Unfolding" in the Watercolour Section. People's Choice Award at the Hunter's Hill Art Prize for "Morning Light Over Lower Fort Street"
First Prize at the Australasian Turf Monthly Equine Art Prize for "Duel" in the Watercolour Section. "Contemporary Australian Art Portfolio" - A publication for an Austrade Export Project marketing Australian Artists entering the American market, promoted by the Australian Trade Commission. View artist's Bio, CV and awards in PDF format.